The aim of this study was to find prediction markers for clinical outcome of larynx cancer after radiotherapy using gene expression profiling. We chose to study early stage tumors since these will be inherently less variable than advanced cancer both in terms of genetically different subpopulations and variability in blood flow and hypoxia. In addition, delivery of the radiotherapy is less complicated with less chance of geographical misses. Any recurrences are therefore likely to be due to inherent resistance of the tumor cells. Secondly, we chose to match recurrent and non-recurrent patients for the most important known clinical variables (T-stage, subsite, treatment, gender and age), so that these would not be confounding factors in the analysis. In the test series, we studied the expression of several sets of genes monitoring biological processes known to influence the outcome of radiotherapy. We found that CD44, chosen as a stem cell marker, showed the most significant correlation with local recurrence. Expression of genes monitoring proliferation and intrinsic radiosensitivity showed no correlation with outcome. A gene set defining acute hypoxia showed a trend, although not significant when corrected for multiple testing. In a separate data-driven analysis including over 8000 genes (after filtering out genes not showing significant expression or significant variation across the samples), the three probes for CD44 came out high in the ranking list of genes correlating with recurrence, one of the probes being the most significant of all genes tested. This non-hypothesis-driven approach supported the hypothesis-driven approach, indicating that CD44 is a good predictor of outcome after radiotherapy in these head and neck squamous cell carcinomas. Furthermore, in an independent validation series, CD44 protein expression measured immunohistochemically correlated significantly with outcome, such that higher CD44 scores were associated with a higher chance of local recurrence. Since both these were matched series, results are independent of the most important clinical predictors. In a previous expression profiling study from our own institute on a series of 91 HNSCC patients treated with concurrent radiation and cisplatin, CD44 was higher in tumors from patients which subsequently developed a recurrence, although this did not reach significance (P = 0.08) (ref. 25). Kawano et al found CD44s and CD44v6 staining correlated with prognosis in a series of 57 patients treated with surgery and radiotherapy (35). Zhao et al analyzed margins after surgery for 112 HNSCC patients and found that CD44v6 presence in these margins, detected with immunohistochemistry, was predictive of recurrence (36). Wang et al. (37) found that one CD44 isoform (v10) was associated with reduced disease free survival in HNSCC. These, together with the present study, support CD44 expression as a negative predictive factor. We chose CD44 as a stem cell marker for HNSCC, since Prince et al. (31) showed that CD44 positive cells in this tumor type were up to an order of magnitude more tumorigenic than CD44 negative cells. These data indicated that CD44 positive cells are enriched in cancer stem cells. However, our and other (38) IHC studies showed a relatively high average percentage of cells staining for CD44, inconsistent with a small minority stem cell fraction. We and others also observed a gradient of CD44 staining, where cells in more basal-like areas stained more positively than cells in the more differentiated areas. Such patterns may reflect more stem like properties of cells in the basal-like areas, analogous to that in normal epithelia. Assuming that CD44 has a causal role in determining the chance of recurrence and is not simply an indirect marker for stem cell content or another unknown process, there are several possible explanations for this role in the many functions of CD44. CD44 is a transmembrane glycoprotein with many transcript variants and has hyaluronan, an extracellular matrix protein, as a ligand (39). Various functions of CD44 have been described, including promoting tumorigenesis, cell motility and invasion. CD44, when activated by ligand, can act as a co-receptor for several membrane receptors, triggering various intracellular signalling pathways. In one of these, CD44 acts as co-receptor for the ErbB family which can lead to activation of the PI3K/AKT pathway, a pathway known to promote survival after cytotoxic damage, including after irradiation. This suggests a possible link between CD44 expression and intrinsic radiosensitivity. However, we did not find a correlation between CD44 expression and radiosensitivity in the panel of larynx cancer cell lines. Alternatives therefore need to be sought to explain the relationship between CD44 expression and radiocurability. Other possibilities are links with hypoxia or repopulating ability, both known to influence radiotherapy outcome. We found that CD44 expression correlated with expression of acute hypoxia genes (Figure 3.8) and a trend (P = 0.08) that expression of acute hypoxia genes correlated with chance of recurrence. No significant relationship with expression of chronic hypoxia genes was found. This is consistent with other studies indicating that cells hypoxic for relatively short times are more dangerous than those chronically exposed to hypoxia (40, 41). We found no evidence of a link between CD44 expression and proliferation associated genes, or in this series between expression of proliferation genes and outcome. This is consistent with our earlier expression profiling studies on advanced head and neck tumors treated with radiotherapy and cisplatin, where proliferation genes were not predictive (25). Whether this is due to relatively slow repopulation rates in these tumors, or because the signatures do not adequately monitor repopulation capacity during fractioned radiotherapy is not known. Figure 3.8. 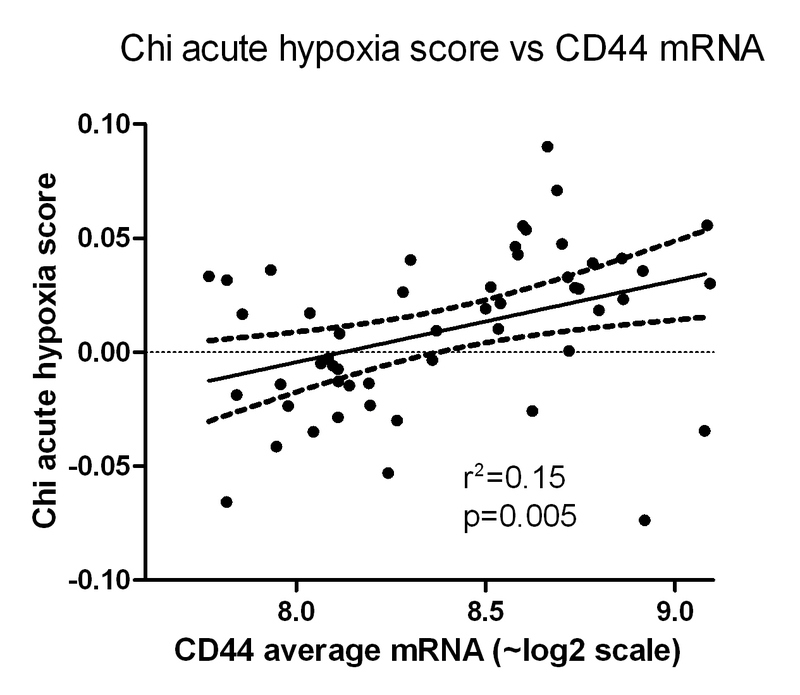 CD44 gene expression, averaged for the three probes, versus acute hypoxia signature score from Chi et al14. A final possible explanation is that CD44 expression monitors the number of stem or cancer initiating cells. It is unlikely that all CD44-positive cells have stem cell properties, considering the rather ubiquitous expression of CD44 in normal tissues (www.genecards.org), and the relatively high average fraction of CD44-positive cells in the tumors studied here and elsewhere (37, 38). However, if the cancer stem cells are a constant subfraction of CD44-positive tumor cells, the stem cell fraction (or tumor initiating fraction) will be directly correlated with the CD44-positive fraction. In the current study, this fraction varied by a factor of around 3. Based on Poisson statistics, such a three-fold change in the effective number of cells which need to be killed by radiation would lead to an absolute change in the cure probability of around 30%; e.g. 1 surviving cell on average would lead to 37% cure probability, whereas 3 surviving cells on average would lead to a 5% cure probability. It is therefore possible that the relationship between cure and CD44 expression is a reflection of the number of cancer initiating cells needed to be killed. This is independent of whether the putative stem cells are more or less radioresistant than bulk tumor cells. This contention is supported by the cell line data where CD44 expression correlated significantly with colony forming efficiency of unirradiated cells (and not with radiosensitivity). This suggests a correlation with cancer initiating properties, since several studies have shown a correlation between in vitro plating efficiency and the number of cells required to produce tumors in animals (42–44). In addition, the Glinsky signature (45), a putative stem cell signature, also showed a strong trend with outcome in the test series (Table 3.3). This BMI-1-driven signature was derived by comparing primary and metastatic prostate cancer. We performed an Ingenuity pathway analysis on this 11-gene signature, also including CD44. The only significant pathway resulting from the analysis showed a link between the Glinsky genes and CD44 through an interaction with TGFB1 (Figure 3.9). While not definitive, these data support the notion that CD44 is in some way monitoring stem cell capacity. 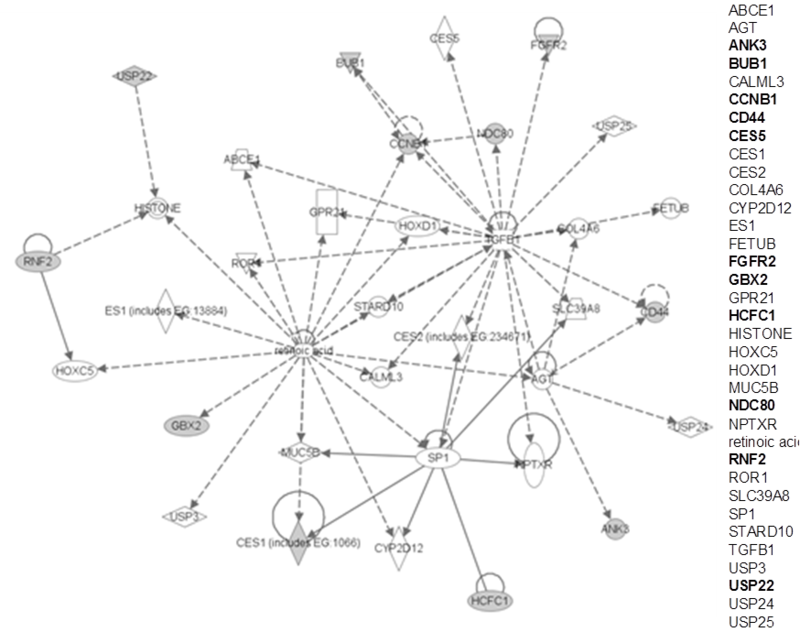 Figure 3.9 Link between CD44 and the Glinsky signature genes. The figure shows the only significant pathway arising from an Ingenuity Pathway Analysis where the input gene list was CD44 plus the 11-gene Glinsky signature. For clarity, all genes are also listed on the right: genes in bold indicate those occurring on the input list. It can be seen that CD44 is linked indirectly to the Glinsky genes via interactions with TGFB1 and AGT. Various CD44 isoforms have been described with different functions (39). In the present study, correlations with outcome were found with mRNA probes for one of the constant regions, and with an antibody against a constantly expressed epitope. Whether variant isoform expression would provide better prediction or understanding of failure needs further study. CD44 expression, both at the mRNA and protein levels in independent patient series, correlated with the probability of recurrence after radiotherapy for early stage larynx cancer. Possible explanations are that CD44 expression monitors the cancer stem cell fraction or that CD44 expression monitors the hypoxic fraction. It will be important to distinguish these two possibilities, since interventions to increase cure in patients with high CD44 expressing tumors will depend on the mechanism (attacking hypoxia, or attacking CD44 itself, or its downstream pathways, or other stem cell specific pathways). Predicting outcome is important partly to spare patients ineffective and toxic therapies. It will be equally or more valuable to provide alternative therapies for patients with resistant tumors. It is likely that CD44 expression, measured with standard immunohistochemical or perhaps PCR-based assays will contribute to better outcome prediction, and the next steps will be to confirm mechanisms and design effective interventions against the consequences of this over-expression. The present data suggest that the association between CD44 and radioresponse reflects an increased number of cancer initiating cells that are usually resistant to radiation and result in a recurrence. CD44 might therefore provide a new marker to predict the radiotherapy response in a biopsy of the primary tumor before treatment is initiated.